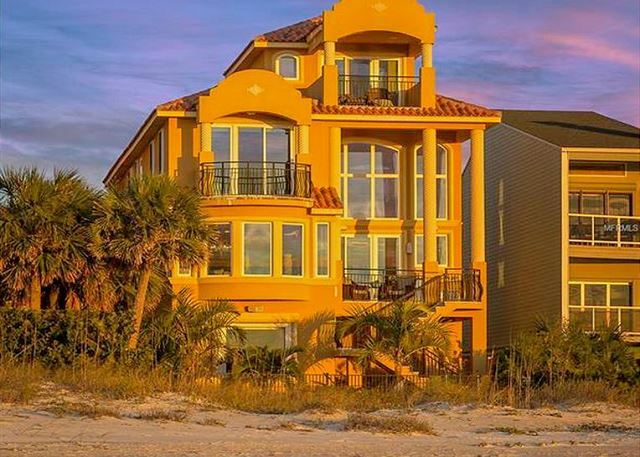 This luxurious grand beach home features 6 bedrooms plus loft , 4 full bathrooms, 2 half bathrooms, elevator, private gated entry, a pool and best of all - it is directly on the sand! This amazing beach villa is located on Indian Shores, Florida - walking distance to shops, restaurants, the jolley trolley and many other attractions. Upon entering the private gated area you will encounter a stunning 5,200 sq Mediterranean beach home - with a dramatic double door leaded glass entry that leads you into the first floor which features an amazing recreation room that includes a billards table, HD projection with big screen, , views of the gulf and direct access to the beach On the second floor you will find an open floor plan with the kitchen, living area, dining area and expansive windows featuring amazing views of the gulf. There are also 3 bedrooms on the second floor and access to the walled pool and hot tub. The third floor has 3 bedrooms along with the master bedroom which has 180 degree view of the gulf. One of the bedrooms has 2 sets of bunk beds, the master has a king bed and the other bedroom has 2 sets of twin beds. There is also a spiral staircase which will lead you into the loft area which has a sofa bed and a half bathroom. Enjoy the best of Florida luxury villas in this amazing beach town that delivers a perfect piece of paradise. This luxury beach front mansion is one of our high end rentals and books up early. We do have last minute special price cuts on cancellations. Please check our official calendar on this site for real time availability and to hold the house online. Online bookings do get preference and there is no obligation to holding any of our houses online. Lowest prices in Sept., Jan., Oct., and Nov.
We are three families from northern Michigan driving down for spring break. The house was amazing. Clean. Spacious. The pool was heated. Excellent for the little kids. We cooked and grilled each evening. We watched sunsets and played baseball and frisbee by the beach each evening. We had excellent contact with the property manager for any needs. I wholeheartedly recommend this property. Great home! We had a wonderful stay and the beach was beautiful! We had a wonderful time. The house was beautiful. There are pull out couches everywhere so it sleeps 18 or so comfortably. The Property Manager Jane was FANTASTIC to work with. IT is RIGHT on the beach, stunning views. We stayed there with our whole family ranging in ages from 19months to 66years old. The game room/area downstairs was a HUGE HIT with the kids. Plenty of beach toys, chairs, etc if you wanted them. I would HIGHLY recommend this house to ANYONE! Also very close to Putt putt a pizza place and Salt Rock Grill (Very nice restaurant). Would LOVE to come back! Thank you for your review and for choosing our "Vista del Mare by BeachHouseFL". We are happy to hear that you enjoyed your stay and I’m looking forward to having you again as a guest in our home. The location was perfect for a reunion of girlfriends! The layout was as described. There were at least 3 coffee makers and a blender for afternoon cocktails. The property was clean and well maintained. Our only complaints: pool area is small and there is very little room to congregate, in other words the pool seemed to be an after thought and isn't terribly inviting for adults. The patio/balcony area is too small for a large group (13) to gather. We could get 6-8 girls around the table but we would have to source extra chairs and many of the chairs around the table are broken/super wobbly. Lastly, there are 2 washer dryer set ups. The washers work well but I think the dryers are so over used and abused by sand that they really won't dry in a timely manner. But overall this home is great for a large group and the access to the beach is great. The house supplies towels and beach games such as corn hole etc. Thank you for your review and for choosing our "Vista del Mare by BeachHouseFL". We are happy to hear that you enjoyed your stay and I’m looking forward to having you again as a guest in our home. We will make sure to address the chairs and dryers with our maintenance staff. we stayed here for our family vacation (20) persons and the house was just perfect, although the layout of the house we didn't really like, it has 4 levels, and the very top level kinda weird, pointless in my poi t of view. the pool is perfect size. beachfront house!! we liked that the house came with like bikes, boards, swimming equipment , etc. The location is perfect also, very close to ice cream places, walking distance, restaurants . Walmart 10 mins away. Property was clean. The best part about this house is the service. Very fast responds from the owner. any issues we had it was resolved within a day. basement has a game room which is very nice! If you're looking for a good time in a beautiful big home, this is it! you wont be disappointed. We were thrilled when we first saw the house and the size for the 17 of us. We had plenty of room for everyone to have a bed and space so we did not feel we were on top of each other. Great space in kitchen, dining and living area. Enjoyed all the beach toys and the game room. The location from house to beach was amazing. Spent most of our time at the beach. The elevator was a pleasant surprise and made getting the luggage and groceries in the house easy. The only real problem we had was with the air conditioning not working properly. After calling the service was quick. We did need to have them come out again to get repairs done. My only other comment would be that the hot water was really too hot. It could be turned down and still be plenty hot enough. All in all truly loved the house, location and beach area. Would consider renting again. Great place to hang out especially to those who have large group of families and friends. Renting this place made our experience much more special. It was a very blessed, awesome and wonderful wedding celebration. Vista Del Mare is simply, outstanding. The entire process. From the agent, to your contact at the house ( Jane is the BEST! 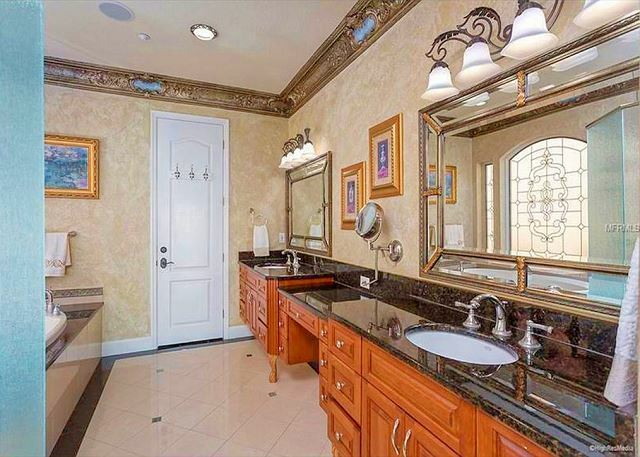 ), to the amenities, to the location. Its rare that you can find a house for 20 people where there are places to get away from the crowd, yet have wonderful common areas. Very short beach there too. Easy in and out all day long. Far away from the REAlL overcrowded masses too. Perfect. Easy to access. Great layout. Outstanding view. Nice to walk right onto the beach. Everything from booking to leaving was an amazing experience! The house is absolutely beautiful! The view of the ocean when you walk in the door is absolutely breathtaking.... the whole home is beautifully decorated, and had everything you could possibly need! The pool and hot top were amazing and we were so sad we had to leave. It was a trip with all adults, but it is a perfect family house as well! Jane, the house manager, went above and beyond to make our stay perfect, and was available whenever we had a question :) We will definitely be staying there again! My family of 20 women, ages 21-72 stayed at the Vista Del Mare for a 3 day weekend and the stay was over the top. All of the staff were great, however Allen whom I booked with was extra professional and patient. Jane our property manager was the absolute best. She made us feel cared about through her service to us, always only a text away and yes, she responds immediately. Everything you see about the house is true. I would definitely recommend a visit, we will for sure return for another beach experience in this beautiful home. Beautiful maintained home directly on the beach. Would love to go back some day! Great comfortable house for large family. Pool and media room perfect for children. Well stocked.Comfortable furniture. Beach unparalleled! What an amazing house this was! Had everything and anything a vacationer could want or desire. The beach was beautiful and private. Had more than enough room for myself and 10 other guests. Would highly recommend this residence for a vacation spot. I will definitely be back to visit this awesome place! Thank you for the great review! Look forward to having you back soon! This was the perfect place for a family! ! Amazing views and it was the closest to the beach we've ever experienced! Easy to work with owners Very well stocked EVERYTHING...kitchen..perfect...even had beach toys for kids. We highly recommend and will def be going again! This is our second time renting from . Loved Vista Del Mare. Great location for renting a boat and dinners out!! The property was wonderful. It was clean and well supplied with everything we needed for both the room and the beach. The sleeping arrangements were perfect for my family. My 3 sons enjoyed the bunk beds and sharing a room. The house was furnished beautifully with all modern amenities. The property itself was ideal. the Billard room offered hours of laughs and entertainment for everyone. Clearwater Beach was amazing, to date one of the best family vacations. My family wants to return next year. the restaurants were outstanding the quality of the food and the cost were a wonderful value, especially coming from North Jersey. We tried different places every day, ( Brown Boxer twice, Cooters twice, Jimmy Iguanas twice, Palm pavilion, salty's and Crabby s) all awesome. The area has plenty to do or just do nothing at all.Depends what your looking for. A return trip is a must.